Can we learn how to overcome depression from an elephant? Nature is a great teacher. I think it is possible to learn how to overcome depression from reading the story of Raju the Elephant. How careful are we about what we replay in our minds day after day? For anyone who is struggling with the pain of depression, my guess is that there are specific stories, words, discussions, real and perceived offenses that play in their mind over and over. 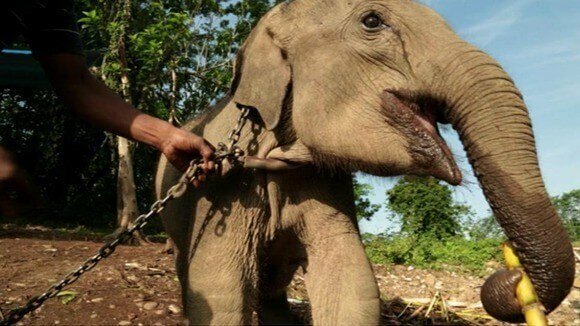 Can we not learn from the following story of this abused elephant of how important it is for us to throw off our self imposed chains of depression? Did you ever think of your depression as a chain that is shackling you to the ground, or even lower, keeping you in the pits? When I became aware of the story of Raju, who welled up with tears in his eyes when he was released from his shackles, I immediately thought about all of the years that depression can coil around us like a python, sucking our life away. Depression can lure us into constantly replaying the same scenarios in our mind, usually of past events, sometimes even from years ago, for which we have absolutely no control to change. Depression can tempt us into thinking that if we mourn about the behavior of others enough, then they might change their behavior towards us. Depression creates the illusion that depression can create change of the circumstances of our life which we hate. Come to think of it, there could be no greater deceiver than depression. All depression will do is to ensure that we remain in that pit of despair, paralyzed with inaction. If you did not think that you could ever find a way to overcome depression, think again. Are we not as worthy as an elephant to be free from these chains of depression? If Raju the Elephant could cry after having been abused by others, by his chains for 50 years, can we not stop abusing ourselves with the depression that we have held on to for days, weeks, months, years or decades? How many years have you been depressed? Why? Do you think that you can release those chains? ALLAHABAD, India — A London-based nonprofit rescued a 50-year-old abused working elephant from the streets of India on the Fourth of July. The non-profit posted a picture of Raju crying shortly after he was freed from the chains he had worn for decades. “He [Raju] has spent almost 50 years in chains and most likely would have died never known freedom; however, on July 4th, Raju took his first steps as a ‘free' elephant,” the nonprofit wrote on their website. The worn down animal was rescued by Wildlife S.O.S. after he was captured in the wild as a calf and kept as a working elephant on the streets of India for most of his life. The nonprofit received a court order in June allowing them to rescue Raju after an Indian forest department alerted the non-profit of Raju's predicament nearly a year ago. Donations helped fund Raju's rescue and recovery. A day before America's Independence Day, a team of wildlife experts and veterinarians traveled to India to save the elephant. 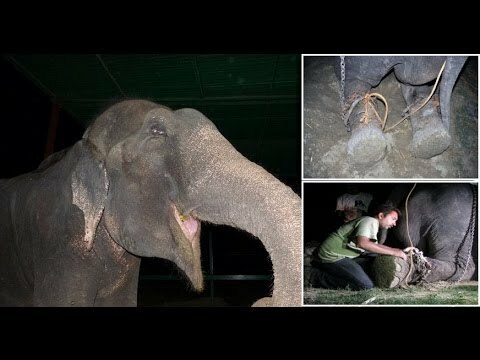 Raju's owner didn't have the proper paperwork to keep him as a begging elephant, allowing the wildlife non-profit to complete their daylong rescue. Veterinarians assisting the rescue said the elephant has deep scars after he spent years being tethered to chains. Raju's owner would beat the elephant to make him beg for money and food from tourists, the nonprofit said. Most of the food Raju received was not nutritious for an elephant, and he was half starved when rescuers found him. In order to gain his trust during the rescue, conservators fed him bananas and jackfruit, a native fruit of India. “Let's all of us wish Happy Independence Day to Raju,” the nonprofit wrote on their Facebook page Friday. Raju's first day of freedom was on July 4. “Have you ever seen a grown elephant cry? This photo [pictured above] is a reminder to all that elephants have strong emotional lives, and they have the ability to suffer deeply. This photo was taken of Raju when the rescue mission first began. He had a flood of tears from his eyes when our team first moved in to secure his freedom. Some would question that Raju was truly weeping; however, our team that witnessed this moment know differently,” the nonprofit wrote Sunday. Floods of well-wishers commented on Raju's rescue and recovery on the wildlife charity's Facebook page. “Hope he has another 50 years to enjoy freedom. So precious, so majestic and now, so free!” one user wrote. “The comments after this story are massively supportive. So glad Raju's experience is touching many,” another user added. Raju's new home will be at the Elephant Care and Conservation Center located in Central Florida. Allahabad, India is located in Northern India.